Oruc Exclusive villas are situated in the perfect location of Dalyan, a small yet popular treasure of a destination! 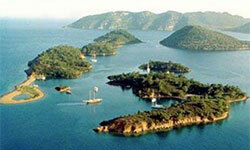 Dalyan is also a productive agricultural zone, famous for its pomegranate and orange orchards. You will find these amongst a wide variety of locally grown fruit and vegetables, alongside handmade foods and gifts on the Saturday Market. 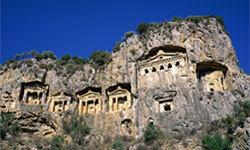 Dalyan is famous for its 4000BC Lycian rock tombs. The well known ‘King tombs’ and the ruins of the ancient city of Kaunos are just a short boat ride across the river from the Dalyanharbour. 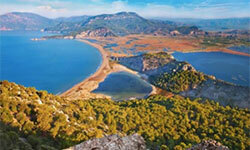 Another wonderful treasure of Dalyan is the beautiful, unspoiled Iztuzu beach. 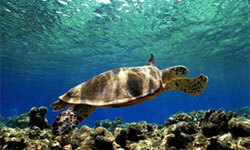 The beach is known world wide as one of the Mediterranean nesting sites of the loggerhead turtles, hence why it is more commonly known as ‘Turtle beach’ Strict rules are enforced to protect the turtles. Visiting Dalyan with Oruc Exclusive villas doesn’t necessarily mean staying in all holiday..we have a wide range of trips and tours available to cater for everyone! From the watersports fanatics, to those who would enjoy a relaxing gullet cruise or visit to the famous Dalyanmudbaths we have it covered. There is a huge range of locally run restaurants and bars to chose from when you venture out of your villa, all within walking distance of the villas available. Night life is plentiful, but kept away from the quieter areas of riverside dining. We can arrange transport for you to get around, or even a chauffeur service to explore the towns around Dalyan.